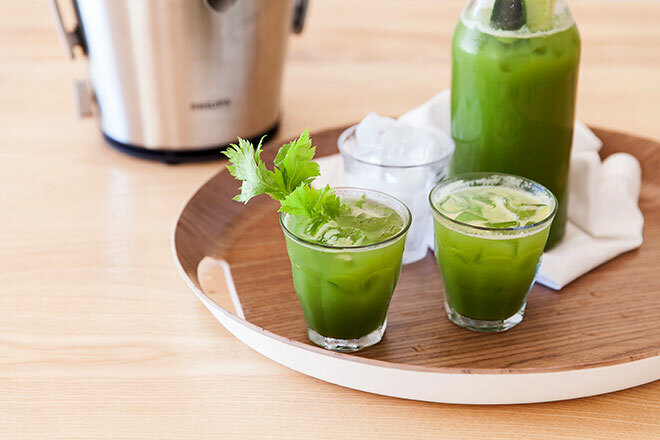 Unless you’re already a happy juicer, a green juice is not the sort of beverage you crave. More like the kind you scrunch your face up over. No, you crave liquids with caffeine, sugar, bubbles and fizz. But what if we told you that it was because your body has never known the potential a green juice like this one holds? The on switch, your super fuel – a cleanser and detox, unparalleled. So, drink coffee, eat cake, but work this health tonic into your diet somewhere and all sins will be forgiven. This is what ‘good for you’ looks like. 1. Fill two glasses with ice cubes and pop them in the freezer. This juice tastes best cold. 2. Prep the fruit and veg according to the size of the feeding tube of your juicer. 3. Next, select the correct setting on your juicer (centrifugal juicers have setting for hard or soft fruit and veg) and feed the fruits and veggies into the juicer. 4. It’s best to put the apples in towards the end, so that they push through as much of the herbs as possible. Leave the chilli out completely if you don’t like your juice to bite back. 5. 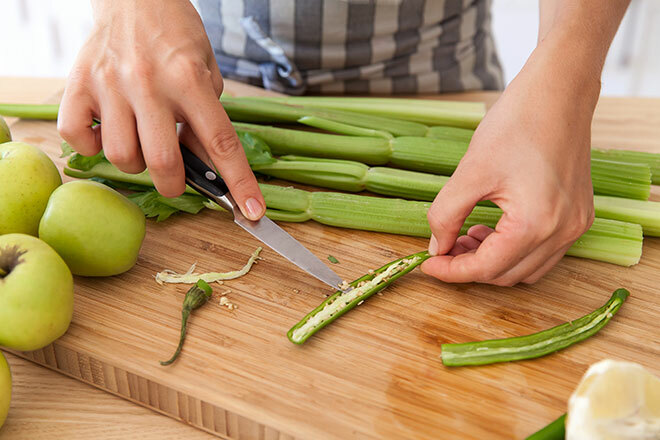 Finally feed the cucumber through last – it will also give the juicer a bit of a rinse as it produces a lot of liquid. And you’re done. Stir the juice with a flat spoon, pour into your frosted serving glasses and enjoy this ultimate health tonic. 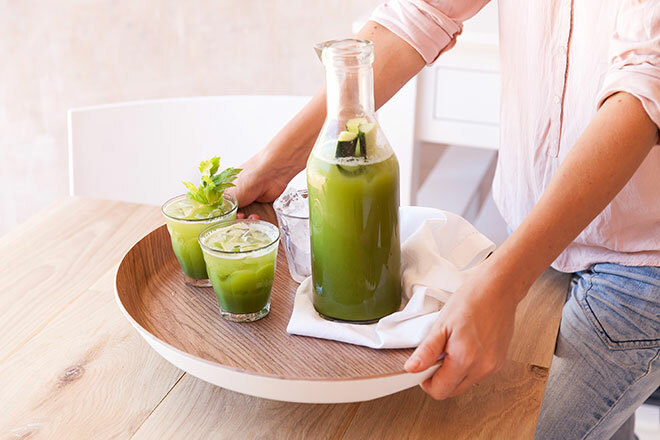 A word of caution, if you’re not used to juicing – this juice may give you a bit of a head rush. But it’s the good kind, so enjoy it.